David Egan has penned songs for artists like John Mayall (“Wake Up Call”), Percy Sledge (“First You Cry”), Irma Thomas (“If You Knew How Much”), Marcia Ball (“Peace, Love, and BBQ” and “Sing It”), and Johnny Adams (the magnificent “Even Now”). He was part of the Cajun band Filé during the ’90s, and is presently a member of the great Swamp Pop ensemble, Lil’ Band of Gold. He also recently participated in the outstanding collection, Louisiana Swamp Stomp, and his 2008 solo release, You Don’t Know Your Mind, was one of the best releases of 2008, and is still a favorite of mine five years later. 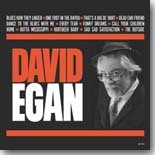 So what if I tell you that his latest release, self-titled David Egan (Rhonda Sue Records), is even better than his previous one? If you heard the previous effort, you might find it hard to believe, but it is, featuring a dozen of Egan’s blues and soul originals that are so much a part of Louisiana that you can feel the funk, heat, and humidity oozing from it. Egan sings and plays piano, backed by Joe McMahan (guitar), Ron Eoff (bass), Mike Sipos (drums) and a host of guest artists who join in on the fun. I could see the opening cut, “That’s A Big Ol’ Hurt,” appearing on somebody else’s album soon, with its devastating lyrics about a love that’s run its course. Egan’s world-weary vocals are the icing on the cake. “Call Your Children Home” is a funky tune about a guitarist that features Zydeco six-string legend Lil’ Buck Senegal. The driving rhythm of “Outta Mississippi” brings Ray Charles’ ’50s Atlantic sides to mind and had this “Mississippi bumpkin” rocking along with it. “Blues How They Linger” is a contemplative slow blues about how good and bad times come and go. You can look for David Egan to be placed somewhere on my Top Ten list at the end of the year. I know it’s still early, but recordings of blues and soul this deep don’t come around every year. If you’ve not had the opportunity to experience Egan’s talents yet, this is a perfect place to start.